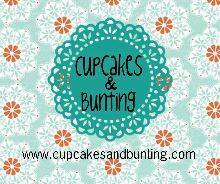 My friend Gail had attempted to start up a small craft group when she closed her Shop earlier this year. Unfortunately it was not really getting off the ground & she asked me to come along & offer some suggestions. This is the mottley odd looking selection we all came home with . . . it was clear this was going to be "an interesting one" !!! I stitched the hearts in rows on my machine then tied them to the branch. Then for the rest of the supplies, I decided to make a lavendar lady doll ... this idea was mainly to use up the soft sculpture face that was in amongst the bits & bobs. An old piece of crochet lace became her shawl, & the remaining crochet flowers got tucked into her tin of wares beside her. I thought you might like to see what the other girls came up with . 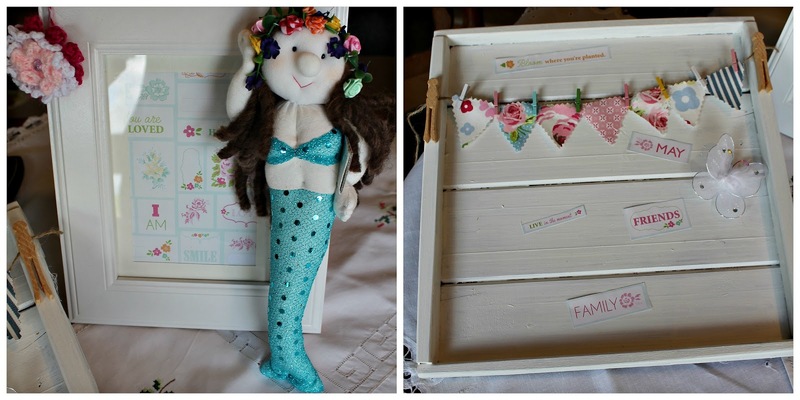 . .
Gail made 3 items, the printed card she framed, then made a mermaid doll using the sculptured face & some silk flowers. I loved the tray she painted & attached a bunting & the pegs & butterfly ... very shabby chic. 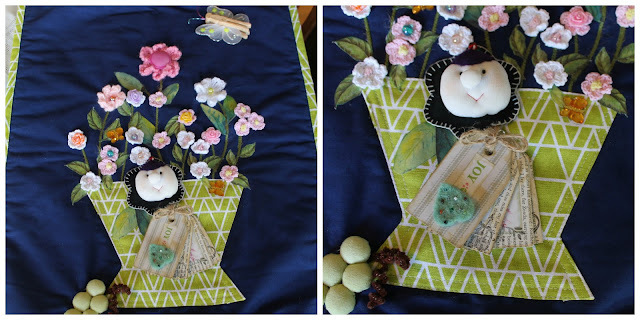 Sharlaine made a gorgeous wallhanging using all of her pieces up. She dyed the pipecleaners to bend as twigs, made the cardstock into swing tags, used all the crochet/silk flowers & beads as flowers to fill her basket. It was stunning. The pegs were used up in the top of the actual hanger part but my photo has missed this out. Liz painted her paper pieces black & made a canvas picture, then added embellishments to it using flowers, beads, buttons. She also made a small "toilet roll person" using up the other left-over bits & bobs. 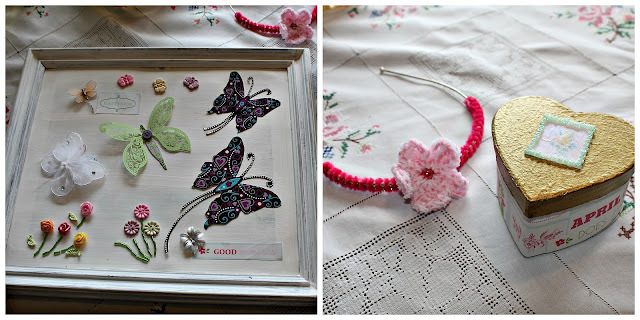 Joyce decorated a shabby chic frame with her bits & added extra butterflies. She also decorated a hair band & a heart shaped box with crochet flowers, papercraft & other bits of bling. Fay thought completely "outside the square" & chose to make a terrarium up using all her bits based on the theme of "a day at the beach". 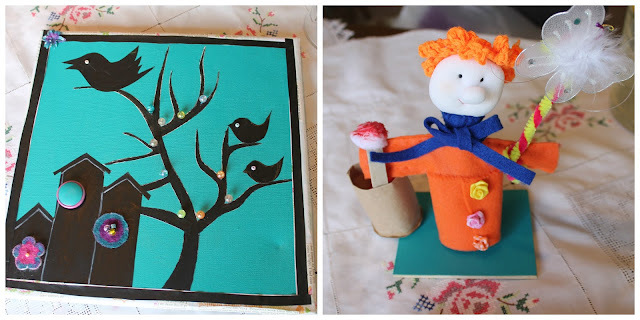 She made characters using the pipecleaners & sculptured heads & added her own unique embellishments. I thought it was fascinating how each one thought quite differently & came up with such a diverse range of end products. It was actually a really enjoyable challenge. 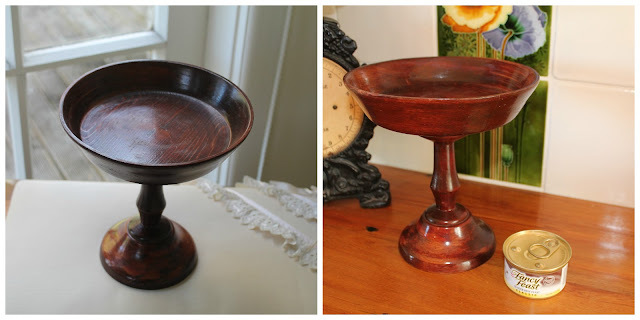 This little wooden bowl-on-a-stand was in the $1 bin at the Op Shop. 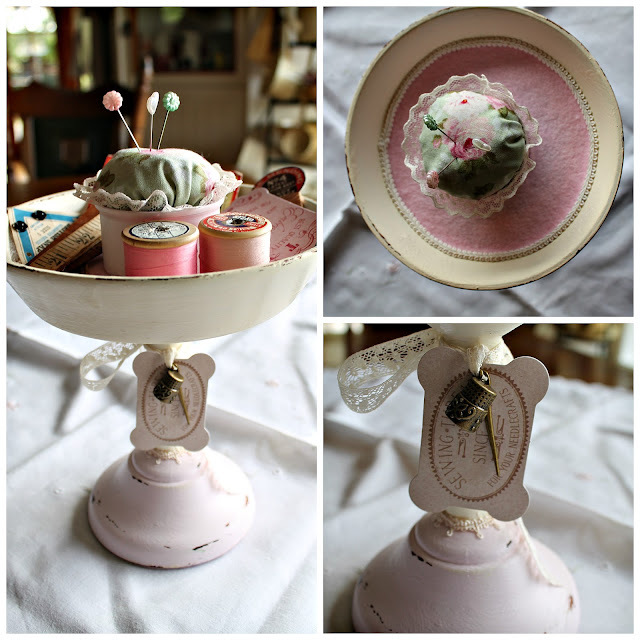 At first my intention was to paint it & then make a big plump wool felt pincushion in the bowl part of it. However, it was seeing it on my bench alongside the Fancy Feast Catfood tin that changed my mind about this somewhat. I decided to add the tin to the centre of it & make a small size pincushion, leaving the outer rim for sewing supplies. This was how it looked when I had painted both the stand & the tin, screwed the tin to the centre & was ready to line the outer rim with felt. The tin is painted pale pink & also the lower base of the stand. The rest is painted cream & sanded to distress it. The circle of baking paper was my "pattern"
This is the completed revamp. I lined the outer circle with pink wool felt, then trimmed this with a pretty braid. I made a pincushion in the (catfood) tin, then tied some sewing related embellishments to the stand. The ladies had a lovely time in the shelter of my deck area having their morning tea. The numbers grew from 15 (yesterday morn) to 29 today !!!! Bit Frazzled there by any chance Julie ????!!! I will be off soon to find my jim-jams .... feeling rather tired. I shall leave you with little Madam-butter-wouldn't-melt-in-your-mouth in the garden yesterday . 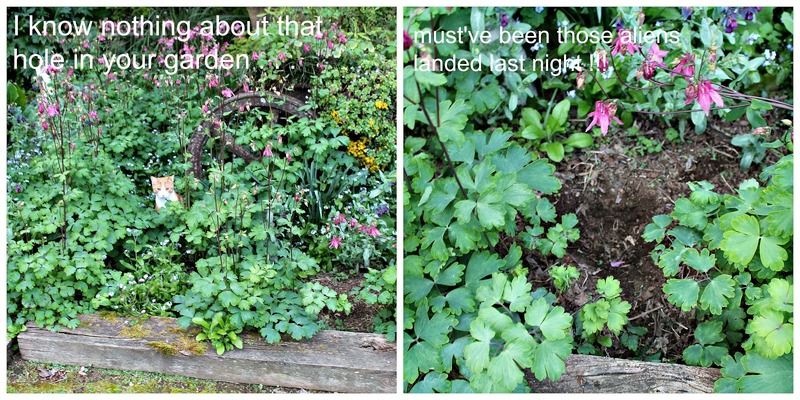 . .
. . . . when I had just discovered she had dug up my miniature tulip bulbs. some when they enter, some when they leave'. :). My! My! What an event..And, so much talent! 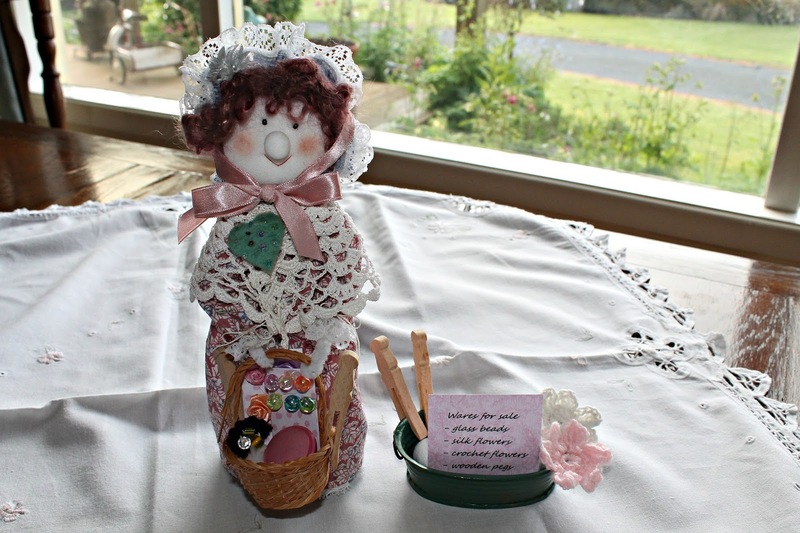 Oh!Love that pedlar doll...really sweet! And, Bless! There's Pippi doing peek~a~Boo! :). colour would you be tickled! :>). and out...Look out charity shops...Here l come! Wow! You should feel tickled pink - it is fantastic - you are so clever! What a wonderful revamp! How could you possibly think Miss Pippi could have done anything to your bulbs - definitely aliens!!!!! Ha... ha...... And the garden visit - golly 15 to 29 - You did so well to cope with them all - well done you - nearly double! Bet they all have a fantastic time! The deck looks lovely all set out for them. And how super it was to see all the different things the craft group made - how very creative. Everybodies was so different and so clever. Oh wow...I have never seen a photo of your Cottage and deck....it's gorgeous. I would imagine people would be flocking to spend a little time there. 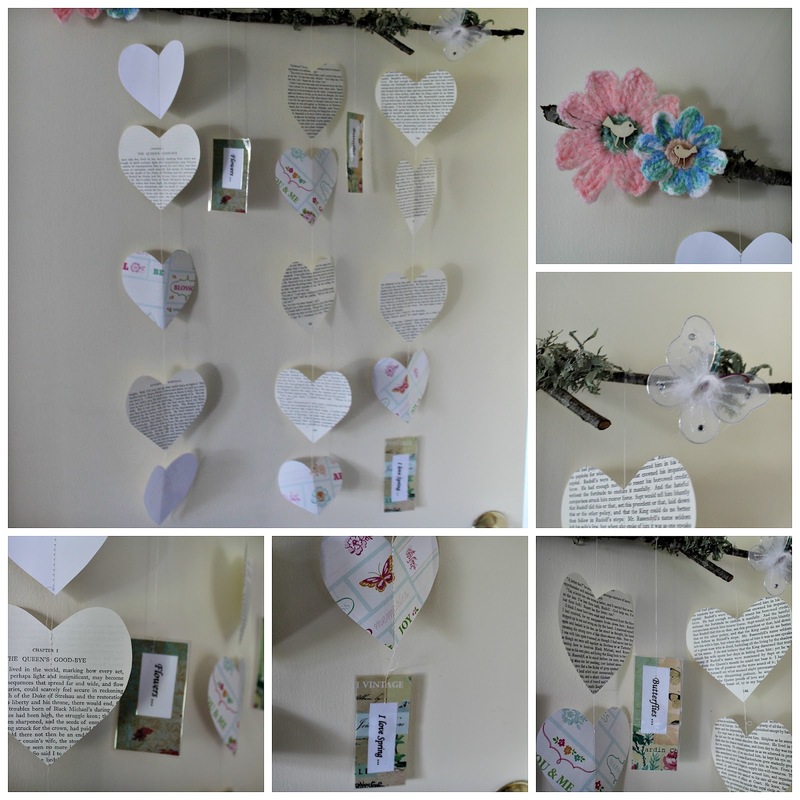 Your craft group does sound like a lot of fun and so much creativity to be found there. 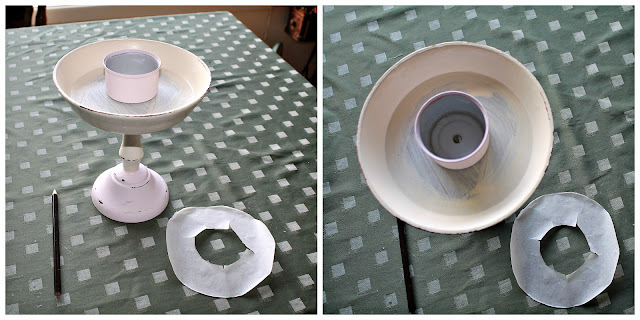 Your wooden bowl and cat tin revamp is amazing. How cool does that look. As for your Miss Pippi, I must say she does sound like a whole lot of fun!! dear little miss pippi, isn't she just a gem? 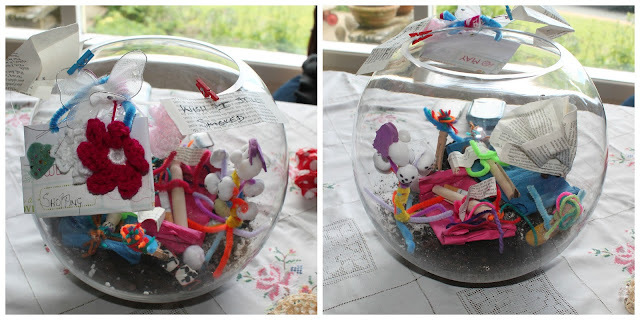 interesting what you all did with the bits & bobs, very clever! Loved seeing what your little collection became. Love your new $1 revamp. It looks so lovely on your deck. Naughty Kitty ! 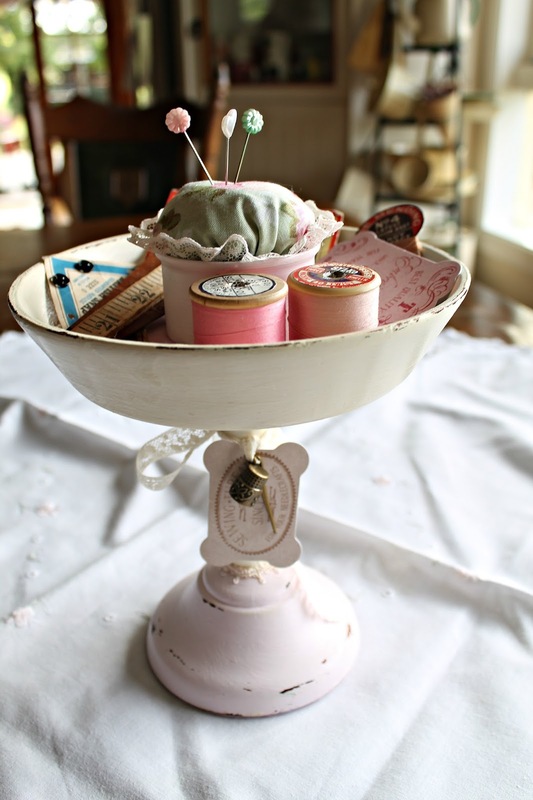 Totally in love with your 'Tickled Pink' pincushion. You're so talented, Julie. I keep saying that to my friends here in Blogland but I really mean it. If you need help with your teas, my friend in NZ is looking for a job! Think she's a bit too far away from you though. Have a lovely, relaxing weekend Julie. x ps How's the baby doing? Love those challenges!!! It can be hard sometimes though!! Love the new pin cushion you made, you always need somewhere to put the other bits and bobs! I bet the garden visitors loved the garden, no matter what the weather!! Wow such different ideas from the same 'stuff'! 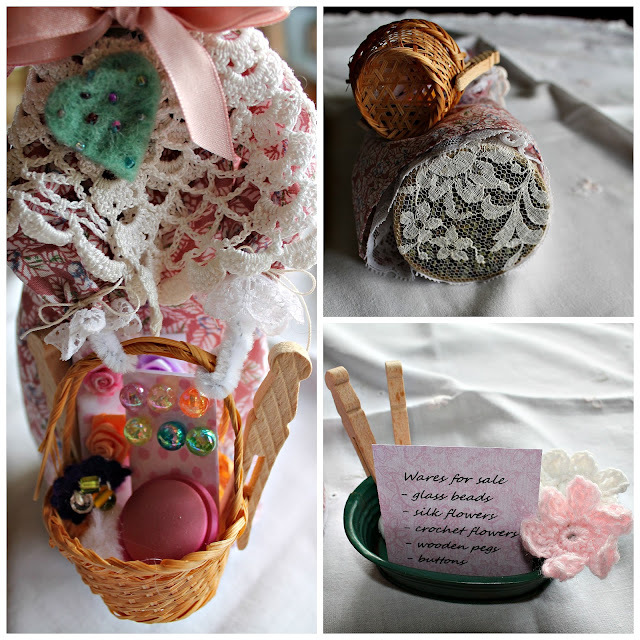 Your new revamp cat food/pincushion creation is worth being tickled pink over......lovely! I hope the garden ladies didn't frighten Miss Pippi too much. jim jams on and have a well earned rest. Amazing the variety of adaptations of your "bits and pieces" you all took home Julie. They are all amazing. It must be a fun group for you all. Dear miss Pippi, forever entertaining. Love your end result of the wooden bowl, a real Julie finish. Gorgeous. That wooden bowl-on-stand transformation is really good. It really caught my eye. The first time I came to your place I was a stranger but I definitely left as a friend!!! I love that sign. OMG that is a crowd on your deck, lucky it is a good size. Pippi!!!!! Little minx. Giveaway Winner & Other bits . . .